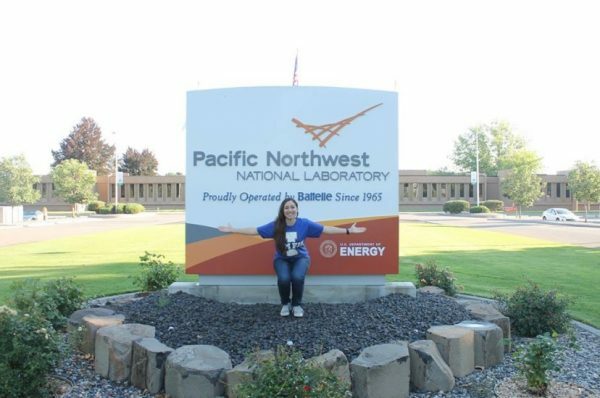 Silvina Di Pietro, chemistry graduate student, at her internship at the Pacific Northwest National Laboratory. 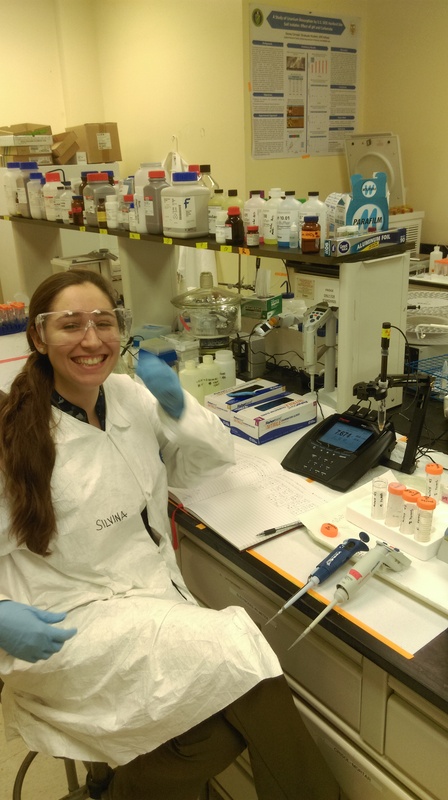 Di Pietro, who holds a bachelor’s in chemistry from FIU, is a Department of Energy (DOE) Fellow at the Applied Research Center (ARC), and she is pursuing her doctoral degree in environmental chemistry. Last summer, Di Pietro was an intern at the Department of Energy’s Hanford Site, a decommissioned nuclear production complex operated by the federal government in the state of Washington. The site was used to produce plutonium for the atomic bomb that brought an end to World War II. As a result of the research, development and production performed at the site, dangerous levels of radioactive waste was generated. High level radioactive waste is safely stored in tanks, but some contaminants of concern has been found in the soil and groundwater. If left untreated, contamination in the soil and groundwater may end up in the Columbia River, the fourth largest river in the U.S.
Di Pietro spent 10 weeks under the guidance of Jim Szecsody, a senior scientist who has worked with Pacific Northwest National Laboratory (PNNL) for three decades. Di Pietro assisted him with conducting laboratory experiments to evaluate the use of sodium dithionite to chemically reduce the iodine found at the Hanford Site. Iodine can accumulate in the thyroid gland and have adverse effects. This toxic element is hard to remediate because it has a half-life of 16 million years. If not remediated it can seep into the groundwater and make the drinking a water unsuitable for consumption. “Working alongside geochemists increased my professional knowledge on the research I am doing. Their invaluable input allowed for my professional growth as a scientist because I emulated their thinking,” Di Pietro says. Silvina Di Pietro, at the Pacific Northwest National Laboratory. This was the second time Di Pietro completed an internship with Szecsody. Her first summer internship, in 2016, consisted of conducting mineral dissolution experiments. 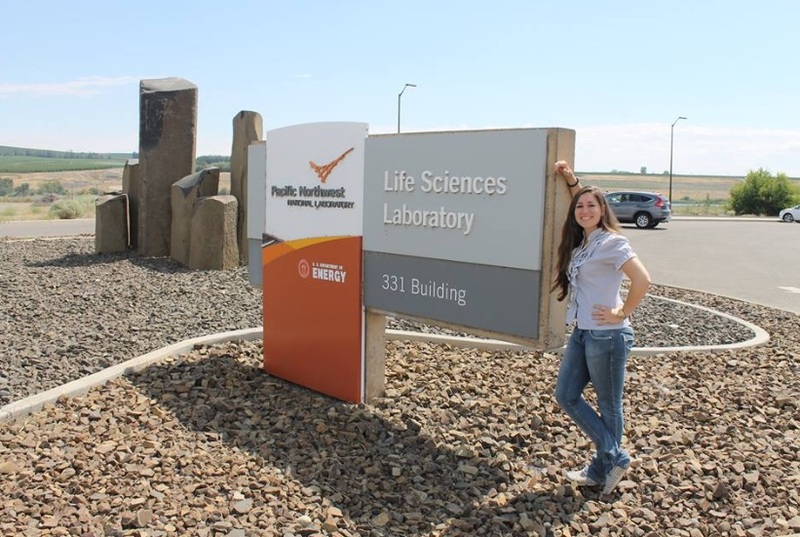 The internships at the Hanford Site helped Di Pietro learn a lot about herself. “I learned that I am capable to work along with scientists to learn more and tackle the environmental contamination problem at the Hanford Site,” she adds. Di Pietro’s internship was a continuation of her work with ARC, where she focuses efforts on the Hanford Site. She has been running tests with minerals found at the site. These experiments are to determine how the radioactive waste, particularly uranium, will interact once the minerals dissolve when in contact with ammonia gas, a potential remediation technique. Silvina Di Pietro, working at an FIU Engineering Laboratory. Before Di Pietro arrived at ARC, she worked as a science teacher at International Studies Charter Middle School. It was there that a fellow teacher encouraged her to return to graduate school. In 2015, she was accepted into the program, but was rejected as a teaching assistant, which meant no financial support. Her mentor, Yong Cai, chairman of FIU’s Department of Chemistry and Biochemistry, told her about ARC and encouraged her to apply for a fellowship. He introduced her to Leonel Lagos, ARC’s director of research and director of the DOE Fellows program. “She seemed passionate about using science for helping our environment and humanity. She also had the “ganas” factor. [Ganas is a Spanish word that means “drive.”] This is a quality we look for when selecting our DOE Fellows,” Lagos says. Recently, Di Pietro received the Innovations in Nuclear Technology R&D Award for the research paper, “Ammonia Gas Treatment for Uranium Immobilization at DOE Hanford Site,” which she presented at the Waste Management Symposia in March of 2017. The research paper explains how to treat uranium, an inorganic and radioactive contaminant, when exposed to ammonia gas.